(Newser) – Congressional negotiators announced an agreement late Monday to prevent a government shutdown and finance construction of new barriers along the US-Mexico border, the AP reports. Negotiators tentatively agreed to far less money for President Trump's border wall than the White House's $5.7 billion wish list, settling for a figure of about $1.4 billion, according to a senior congressional aide. (The Washington Post uses the term "fences" to describe what would go up.) 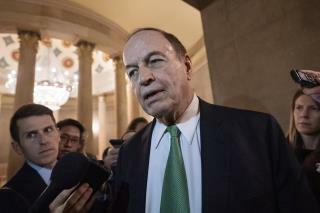 "We reached an agreement in principle," said Senate Appropriations Committee Chairman Richard Shelby, an Alabama Republican, appearing with a bipartisan group of House and Senate lawmakers who concurred. Details won't be released until Tuesday, but the pact appears to arrive in time to alleviate any threat of a second government shutdown this weekend. "With the government being shut down, the specter of another shutdown this close, what brought us back together I thought tonight was we didn't want that to happen" again, said Shelby. The pact also includes increases for new technologies such as advanced screening at border entry points, humanitarian aid sought by Democrats, and additional customs officers. Shelby had earlier pulled the plug on the talks over Democratic demands to limit immigrant detentions by federal authorities, but Democrats yielded ground on that issue. Asked if Trump would back the deal, Shelby said, "We believe from our dealings with them and the latitude they've given us, they will support it. We certainly hope so." In other words, something else for Trump not to sign or veto. "So we'll give him $1.4B, but we'll say it's for "fences"...yeah". So once again, both sides win and both sides lose. The Show continues. The real reason that the repubs crossed over and signed the deal is because it includes $1.25 BILLION for the installation of VICE OFFICER detection devices for airport mens rooms. This way when they enter an airport mens room and want to tap on the stall next to their's hoping for another "family values christian" to reply, the devices will warn them if there are vice officers in the bathroom. Dennis Hastert, Larry Craig, Lindsey Graham, Wes Goodman, Bill O'Daklown and Eric Bolling all were heard to mumble "where was that technology when I was on the DOWN LOW?"